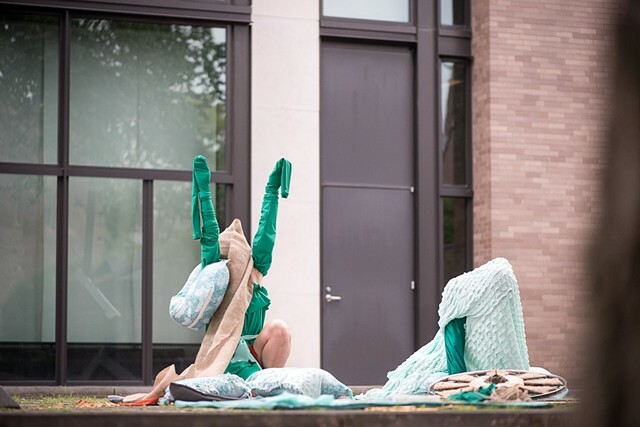 Traveling In Place is an improvisational performance and installation created and performed by Rachel Bernsen and Megan Craig, a visual artist and Associate Professor of Philosophy at Stony Brook University, New York in conjunction with the special exhibition at the Yale University Art Gallery: Small-Great Objects: Anni and Josef Albers in the Americas. Based on ideas about localized customs and micro- movements, weaving, fabric as architecture, and communicative patterns, Traveling in Place involves chance rotations and interactions between Bernsen and Craig as they move in and between three demarcated floor spaces, each with its own set of material and dynamic characteristics. The performance involves entanglement and experimentation with thread, wheels, fabric, and wearable sculpture. A 30-minute sound score, created by Nick Lloyd and Megan Craig, accompanies the work.